Royal Caribbean has taken delivery of Spectrum of the Seas, a new cruise ship and the first in the Quantum Ultra class. The ship will be based out of China and is the 26th ship in the fleet. Further below we have video footage of the ceremony. 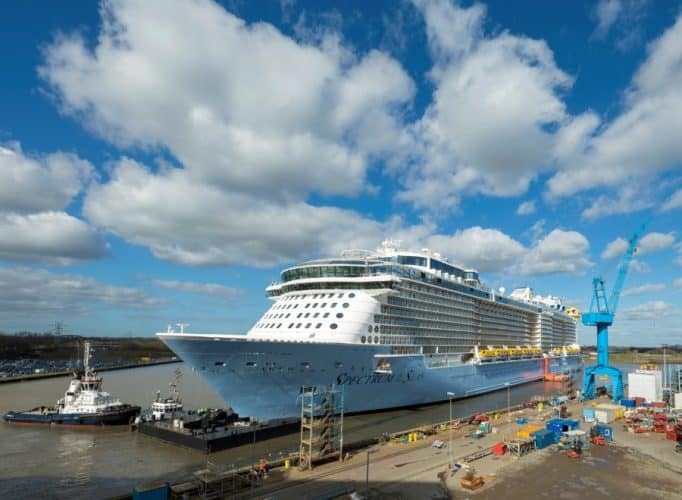 The newest Royal Caribbean cruise ship has officially joined the fleet after being delivered from the Meyer Werft which is based in Papenburg, Germany. A ceremony was held in Bremerhaven, Germany which marks the handover and the responsibility of the ship shifting to the cruise line. Attending was Royal Caribbean and shipyard executives along with all the crew members. The new vessel is an evolution of the Quantum-class ships and does look very similar. However, she’s larger and has a guest capacity of 4,246 along with 1,551 crew members. Spectrum of the Seas has been purpose-built for the Chinese market. Highlights include the first ever exclusive suites-only area which is a private enclave on decks 13 through 15 at the forward part of the ship. The area will also feature Golden and Silver suite accommodations with a private elevator, a dedicated restaurant, exclusive lounge and even a shopping area for a private experience. The ship will have a two level 2,809 square foot Ultimate Family Suite which can accommodate up to 11 guests, This follows the suite which was first introduced on Symphony of the Seas. To cater for the Chinese guests there will be a Sichuan Red dining venue, Wonderland’s Dadong restaurant, Leaf and Bean tea venue and more. 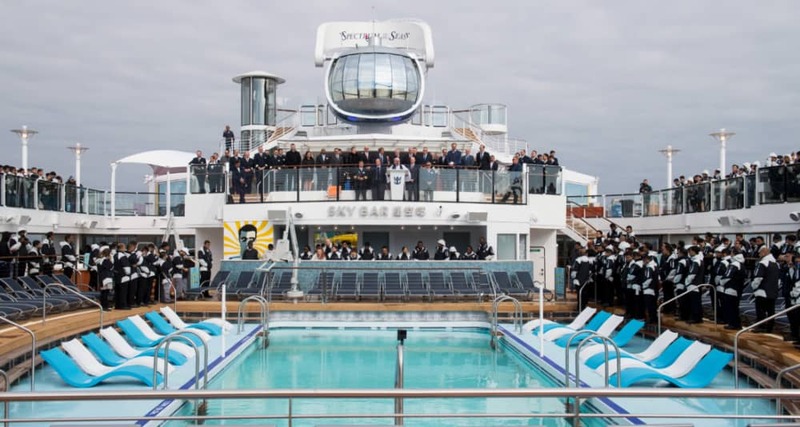 Guests can expect to see all the popular feature which can already be enjoyed on the Quantum class ships such as SeaPlex, North Star and RipCord by IFLY. Spectrum of the Seas will be one of the first ships to feature the new Sky Pad located at the aft. However, it’s not known if this feature will be open due to safety concerns after an injury on Mariner of the Seas. Spectrum of the Seas will depart on a 46-night Global Odyssey voyage from Barcelona, Spain on April 18, 2019. The new ship will begin cruises from Shangai, China this June. For the winter 2019 season, the vessel will reposition to Hong Kong for Holiday Cruises.